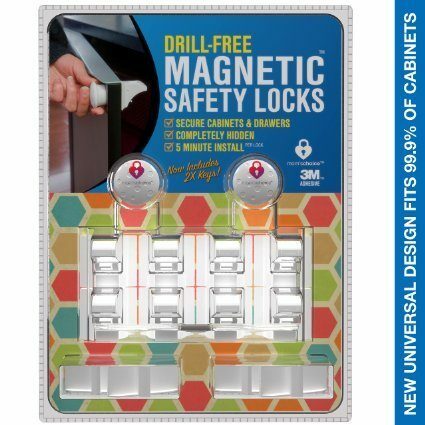 Drill Free Magnetic Safety Cabinet & Drawer Locks $35 + FREE Shipping! You are here: Home / Great Deals / Amazon Deals / Drill Free Magnetic Safety Cabinet & Drawer Locks $35 + FREE Shipping! Head to Amazon to check out these Drill Free Magnetic Safety Cabinet & Drawer Locks for $35 + FREE Shipping! Ok, these are expensive even though they have been marked down from $50! But if they work for you they will be great! Having to drill all the safety latches onto every low cabinet in the house can take forever and then you have holes in your cabinets. These install with 3M removable strips, so it’s a win-win!